Powell's Books is a chain of bookstores in Portland, Oregon, and its surrounding metropolitan area. Powell's headquarters, dubbed Powell's City of Books, claims to be the largest independent new and used bookstore in the world. Powell's City of Books is located in the Pearl District on the edge of downtown and occupies a full city block between NW 10th and 11th Avenues and between W. Burnside and NW Couch Streets. It contains over 68,000 square feet (6,300 m2), about 1.6 acres of retail floor space. CNN rates it one of the "coolest" bookstores in the world. The City of Books has nine color-coded rooms and over 3,500 different sections. The inventory for its retail and online sales is over four million new, used, rare, and out-of-print books. Powell's buys around 3,000 used books a day. Powell's was founded by Walter Powell in 1971. His son, Michael Powell, had started a bookstore in Chicago, Illinois, in 1970 which specialized in used, rare, and discounted books, primarily of an academic and scholarly nature. In 1979, Michael Powell joined his father in Portland, right after his father's store was not offered a lease renewal; within a year, they found the location that became its current headquarters. Michael bought the bookstore from his father in 1982. In 1984, Powell's opened its first branch store, in a suburban shopping center named Loehmann's Plaza (later renamed Cascade Plaza), near Washington Square. The new branch was not a replica of its City of Books location; Powell was concerned that the "edgy" neighborhood of its headquarters location was limiting its customer base, so the new store was "fairly fancy" with white shelving, a tile floor, and banners over the aisles. It was also four times the size of the typical chain bookstore. A travel bookstore was established in 1985 on Pioneer Courthouse Square, and other stores followed, one a year for the next few years. By the early 1990s, Powell's bookstores were part of the resurgence of the independent bookstore, which collectively made 32 percent of book sales in the U.S. The travel store closed in 2005. Powell's NW 11th & Couch entrance, featuring the "Pillar of Books". Powell's established its Internet presence in 1993, beginning with email and FTP-based access to its technical bookstore; it has since expanded to incorporate fiction and other genres as a traditional ecommerce site. Their website was established in 1994, before Amazon.com, and has contributed substantially to the chain's recent growth. The City of Books location grew to its current size after an expansion that opened in 1999; it included a new entrance facing the Pearl District which featured the "Pillar of Books", a Tenino sandstone carving depicting a stack of eight of the world's great books, on a base with the inscription "Buy the book, read the book, enjoy the book, sell the book" in Latin. For the year ending June 2000, Powell's revenue was $41.8 million. In 2002, Powell's was cited by USA Today as one of America's 10 best bookstores. Since 2005, its website has also offered DVDs with free shipping, with an inventory of over 40,000. 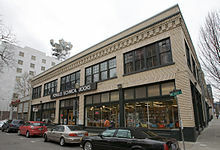 In January 2008, Powell's announced plans to expand the downtown City of Books by adding as many as two floors to the store's southeast corner. The expansion was due to add at least 10,000 square feet (930 m2) of new retail space. Plans submitted to the Portland Design Commission in November 2008 called for a rooftop garden atop the new addition and an "art cube" over a redesigned main entrance. Powell's Technical Books at its original North Park Blocks location (closed in 2010). In March 2010, Michael Powell confirmed plans to hand over management of the business to his daughter Emily as of July. That same month, Powell's announced it would close its technical bookstore on the North Park Blocks, moving its sections on math, science, computing, engineering, construction and transportation into "Powell’s Books Building 2" at the corner of 10th and Couch Street, near the main City of Books location; the consolidation was in response to a five-year decline in brick-and-mortar sales of technical books in favor of online sales. In October 2010, Powell's announced it had bought 7,000 books from the library of author Anne Rice; Powell's offers these association copies on their website. The bookstore was revealed as a charter member of the Google eBooks service when the news was announced by Google on December 6, 2010. In June 2011, Powell's participated in Google Offers during that service's first month of operation; according to TechCrunch—which characterized Powell's as a "Portland institution"—"5,000 Powell’s vouchers sold out in a matter of hours", making it "most popular deal in the month." Starting in May 2012, Powell's began offering access to print on demand books via the Espresso Book Machine. In early 2013, Emily Powell announced that Miriam Sontz, the company's chief operating officer, would take over as chief executive officer. In late 2014 "Powell’s Books Building 2" was closed and the technical books at that location were moved into the main City of Books location. CEO Miriam Sontz retired in January 2019. Emily Powell remains president and owner. In 1991, following some post-holiday lay-offs, some of Powell's employees formed an organizing committee, seeking to become part of the Oregon Public Employees Union (OPEU). They got more than 35% of the employees to sign union cards but chose not to file for a union certification election because less than 65% had signed, a threshold suggested by the OPEU. In response to issues identified by the organizing employees, Powell's updated and expanded its employee handbook in April 1992 with changes that addressed processes for problem solving and grievances, the probation and termination procedure, and other employee assistance, among other changes. In September 1998, email from Powell's managers announcing reductions in employee’s wage increases prompted the creation of a new organizing committee of 26 employees. They chose the International Longshore and Warehouse Union (ILWU) because they could charter their own self-governing local union which would include about 350 employees serving in a variety of jobs in all stores and in the Internet, corporate, and shipping departments. By March 1999, they filed for a union certification election with the National Labor Relations Board. A month later, by a vote of 161–155, ILWU Local 5 became official. In September 1999, ILWU Local 5 met for the first time with Powell's management, to begin the contract bargaining process. After some early successes, 2000 saw a slowdown in the discussions, followed by rallies, filings of unfair labor practices, an unsuccessful decertification campaign, a one-day shutdown of the shipping department (accompanied by the slashing of a van's tire), and federal mediation. A three-year contract was finally announced in August 2000. In February 2011 Powell's announced the layoffs of 31 employees, over 7 percent of its unionized workforce, in “response to the unprecedented, rapidly changing nature of the book industry". It was the first round of layoffs since the store’s workers formed a union. A union representative said that Powell's had reduced its workforce by about 40 in the prior year through attrition, but felt that layoffs were still necessary because of a decline in sales of new books and a rise in health care costs. Powell’s Books was a key opponent of Oregon’s Measure 97, which would have raised corporate taxes to fund schools, healthcare and senior services. Michael Powell contributed $25,000 to the opposition campaign. Powell’s Books was featured in television ads for the No campaign, and Emily Powell signed a statement opposing the measure in the voter's pamphlet. a store with cooking and gardening materials two spaces east of the Hawthorne store (it was announced in January 2016 that Powell's will be taking over the lease of the space between the general interest store and the home and garden store and combine the two stores into one, with larger children's books and authors' event sections). one store at the Portland International Airport, offering popular fiction and non-fiction, "choice" used books, games, toys, and gifts. ^ a b c d e f g h Inside Indie Bookstores: Powell’s Books in Portland, Oregon from the March/April 2010 issue of Poets & Writers Magazine. Retrieved 2016-06-18. ^ a b "Powell's to move Tech Store". Portland Business Journal. March 4, 2010. Retrieved December 7, 2010. ^ Chamberlin, Jeremiah. "Inside Indie Bookstores: Powell's Books in Portland, Oregon". Poets & Writers. ^ a b "Powell's Books on Burnside". Powell's City of Books. Retrieved March 12, 2009. ^ Frances Cha (July 30, 2014). "World's coolest bookstores". CNN. Retrieved June 18, 2016. ^ "Internet Retailer Best of the Web 2006". Internet Retailer. Archived from the original on February 14, 2009. Retrieved August 28, 2007. ^ a b Powell's Books at Cedar Hills Crossing Archived February 27, 2007, at the Wayback Machine from the company's website. Retrieved 2012-07-14. ^ a b "Loehmann's Plaza gains 85 percent occupancy". (November 25, 1984). The Sunday Oregonian, p. D11. ^ "Beaverton retail mall rechristened". (June 2, 1987). The Oregonian, p. D8. ^ Nkrumah, Wade (February 7, 2005). "Food carts at Pioneer Square may be ousted". The Oregonian, p. C1. ^ USA Today, January 21, 2002. "10 Great Places to Crawl Between the Covers". Retrieved 2016-06-18. ^ Bennett, Sam (November 13, 2008). "New design for Powell's Books features an art cube". Daily Journal of Commerce. Retrieved June 18, 2016. ^ Gunderson, Laura (January 22, 2008). "Powell's plans expansion in two years". The Oregonian. Retrieved January 24, 2007. ^ Nawotka, Edward (January 23, 2008). "Powell's to Expand Flagship in 2010, Absorb Technical Store". Publishers Weekly. Archived from the original on February 9, 2008. Retrieved January 24, 2007. ^ Giegerich, Andy (October 26, 2010). "Powell's Books buys Anne Rice collection". Portland Business Journal. Retrieved December 7, 2010. ^ "Discover more than 3 million Google eBooks from your choice of booksellers and devices". Official blog. Google. December 6, 2010. Retrieved December 6, 2010. ^ Agrawal, Rocky (July 4, 2011). "Google Offers Versus Groupon: The Portland Throwdown". TechCrunch. Retrieved July 11, 2011. ^ "The Espresso Book Machine Arrives at Powell's Books" (PDF). Press release. OnDemandBooks.com. May 4, 2012. Retrieved May 14, 2012. ^ "EBM Locations: List View". OnDemandBooks.com. Retrieved May 14, 2012. ^ Hallett, Alison (May 4, 2012). "More on Powells' New Espresso Book Machine". The Portland Mercury. Retrieved June 6, 2014. ^ "Owner, new CEO of Powell's Books see strength in brick and mortar". The Oregonian/OregonLive. April 25, 2013. ^ "New Laws, Northwest Fires, Changes In The Book Biz". OPB. January 3, 2019. ^ "CEO of Powell's Books will retire in January 2019". KATU News. ^ Bosman, Julie (February 9, 2011). "Powell's Books Announces Layoffs". The New York Times Arts Beat blog. Retrieved February 9, 2011. ^ "Oregon Secretary Of State". secure.sos.state.or.us. Retrieved January 19, 2017. ^ "Oregon Business Tax Increase, Measure 97 (2016) - Ballotpedia". Retrieved January 19, 2017. ^ "Online Voters' Pamphlet | Oregon Secretary of State". sos.oregon.gov. Retrieved January 19, 2017. ^ Marum, Anna (January 6, 2016) [print-edition date January 8, p. C1]. "Powell's Books to expand Hawthorne location". The Oregonian. Retrieved February 1, 2016. Wikimedia Commons has media related to Powell's Books.